Whether you're deep-frying a turkey, browning some ground beef or frying some bacon, whenever you use cooking oil especially when cooking something with a lot of fat, you end up with a lot of used oil left over. Here are the right and wrong ways to dispose of it. First of all, if you plan to deep fry soon in the future, chances are you can save the cooking oil to use again. Strain it through a coffee filter or several layers of cheesecloth to remove any particles and crumbs, and store it in an airtight container in a dark place. You can reuse oil only once or twice, and give it a sniff before using it; if it smells rancid, get rid of it. Remember that each time you reuse oil, the oil deteriorates and the smoke point (the temperature at which it will burn) decreases. If you decide not to save your cooking oil, or if it's gone bad, it's important to dispose of it properly. It's wise to check with your local solid waste department to see if they have any recommendations or regulations about disposing of oil. 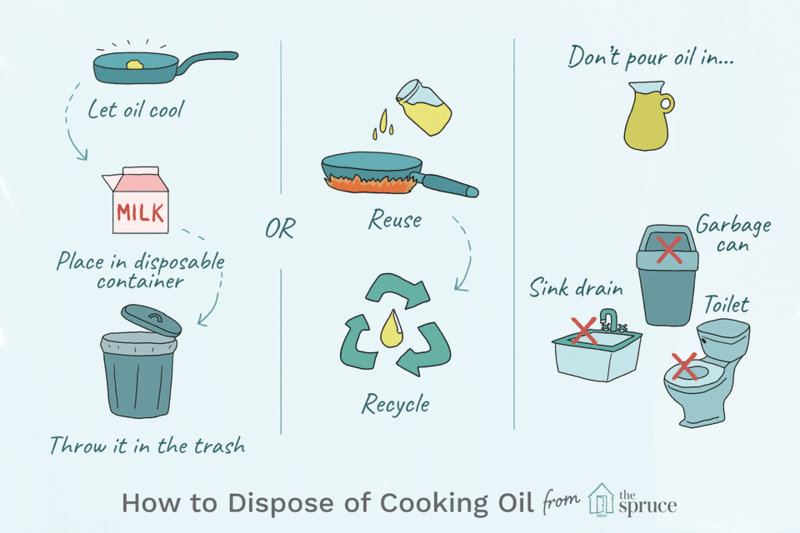 If you're discarding cooking oil at home, take the proper steps. Let the oil cool completely, then pour it into a non-recyclable container with a lid, and throw it in the garbage. Common non-recyclable containers that work well include cardboard milk cartons and similar wax- or plastic-lined paper containers as well as takeout containers. Freeze or refrigerate the oil first to harden it. Pour the oil in an old can and put it in the freezer. Throw away the oil when it's solid enough to come out of the can in one piece. If you have no more than a cup of oil or grease, pour it into a coffee mug and set it in the fridge. When it solidifies, scoop it out and into the trash with a spoon, then wipe out the mug with a paper towel or used napkin before washing it. Pour completely cooled oil into a partially filled trash bag. If you use plastic kitchen trash bags, it's usually fine to pour a moderate amount of oil into the trash already in the bag; paper towels, food scraps, and other absorbent material help contain the oil so you don't have a pool of it waiting to break out of the bottom of the bag. Mix the oil with an absorbent material, such as cat litter, sand or sawdust, before throwing it away. Save old oil for the next time you empty the litter box, and dump the oil into the litter. Consider getting a Fat Trapper system if you do a lot of frying. This is a plastic receptacle that holds foil-lined bags. Just pour the oil into the bag, and when it's full, seal the bag and throw it in the garbage. Each bag holds 32 ounces of oil. Some cities have collection programs for used cooking oil to recycle it into biodiesel. You can check Earth 911 to see if there's a recycler near you that will accept it. Biodiesel is a clean-burning fuel that is used in many types of motor vehicles (often city trucks and fleet vehicles) and can be used as heating oil. Don't pour oil down the drain or in the toilet. It can clog not only your pipes but also the city sewer mains. Water contaminated with oil is difficult, sometimes impossible, to treat. This means it can eventually pollute local waterways. Don't add oil to a septic system. It can clog pipes and, worse, your distribution lines and drainage field. Don't dispose of oil in compost bins or piles. Fats, in general, are bad for compost, and cooking oil is nothing but fat. Don't pour hot oil into the trash. How Do You Use a Turkey Injection Marinade Correctly?